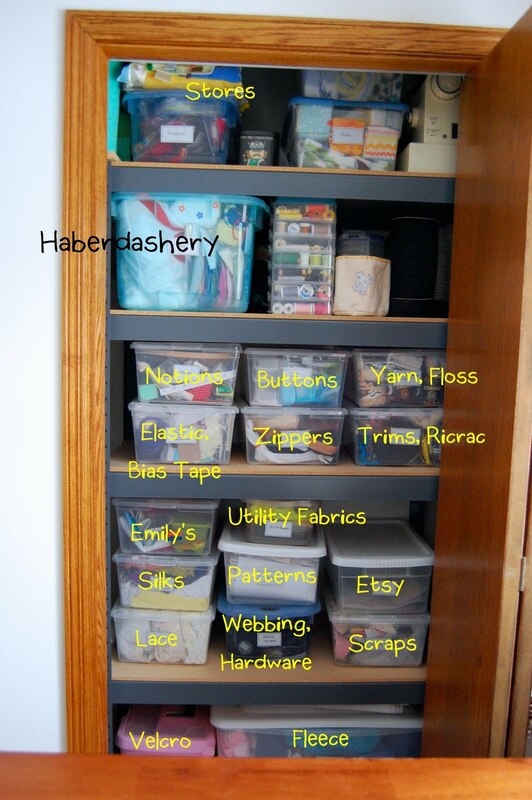 I've organized my sewing room! It took me 5 days. Not bad, considering that there were children helping. Every 5 minutes a small person would come to ask for a snack, or to use the bathroom, or to put a dress on a doll, or find a puzzle piece, or something. And there were also meals -to be cooked and eaten - that got in the way. Sorting the fabric was actually the easy part, humiliating as it was to see some of the prints my teenage self thought were cool. After the kids were in bed, I put on a movie and watched dragons scorch entire cities as I placidly sorted and folded. Nice relaxing evening. Unfortunately, my stash is only 1/3 fabric. The other 2/3 is notions, hardware, remnant supplies from old projects like jewelry-making and stained-glass painting (look who had too much time on her hands before she got married and had kids!!!!) and, well, it was like opening a can of worms. I should probably mention that this was an organization, not a re-organization. 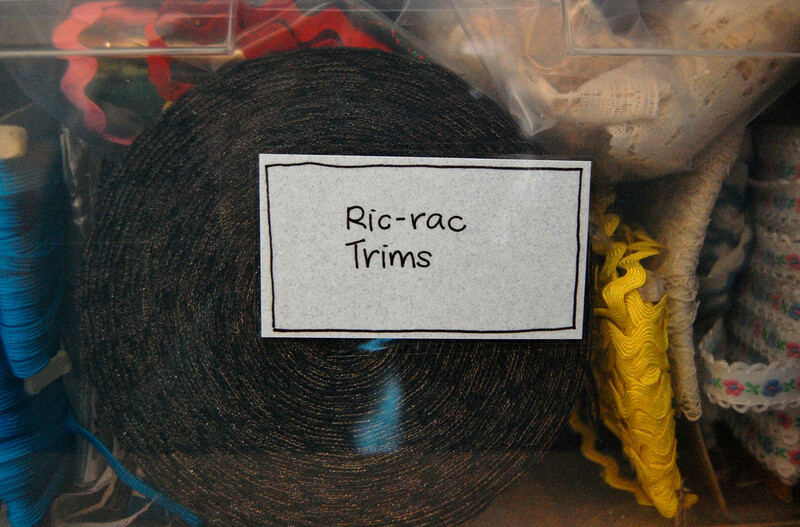 That's right- before this, I'd never organized my sewing room. Sure, I tidied it up from time to time, and bought tubs for storing notions and stuff, but there never was a system. 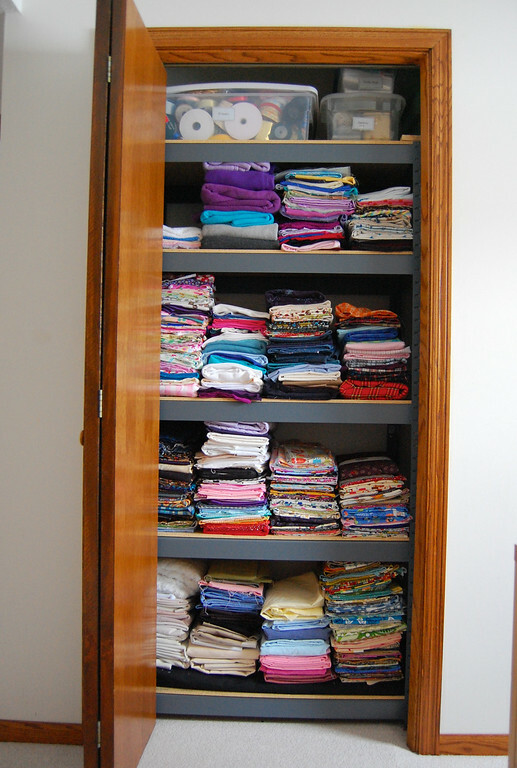 When I moved from Singapore, I packed all the fabric I had into cardboard boxes. When they arrived here, I literally dumped them all out into the hugest tub I could find. It was never sorted, and stayed that way for the next 5 years, buried under new layers of more recent purchases. Anyway, it's done. It won't look this neat for long, and time will tell if there is a workable system here, but it got me to throw out a lot of rubbish, so no complaints. I thought I'd document the After photos (see the Before photos in this earlier post) so that if I mess it all up again next week in the future, I can come back here and reorganize it back to where it was. 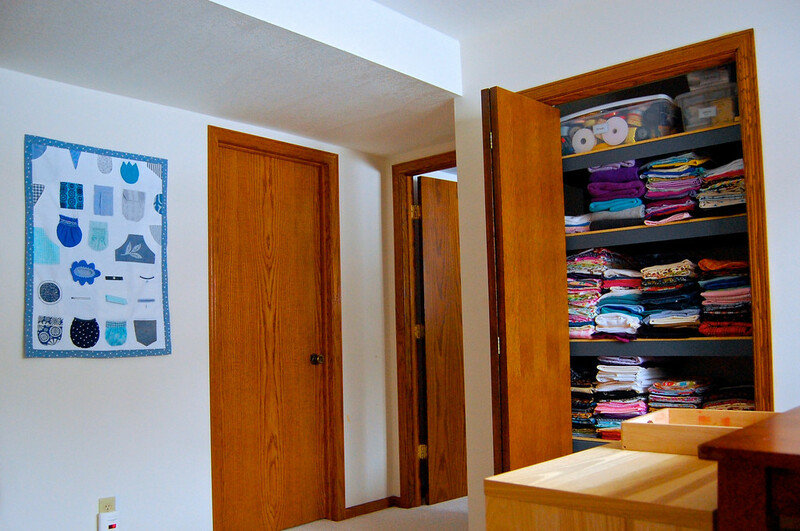 Here's the overview shot - two closets. and the leftovers from long-ago jewelry making. 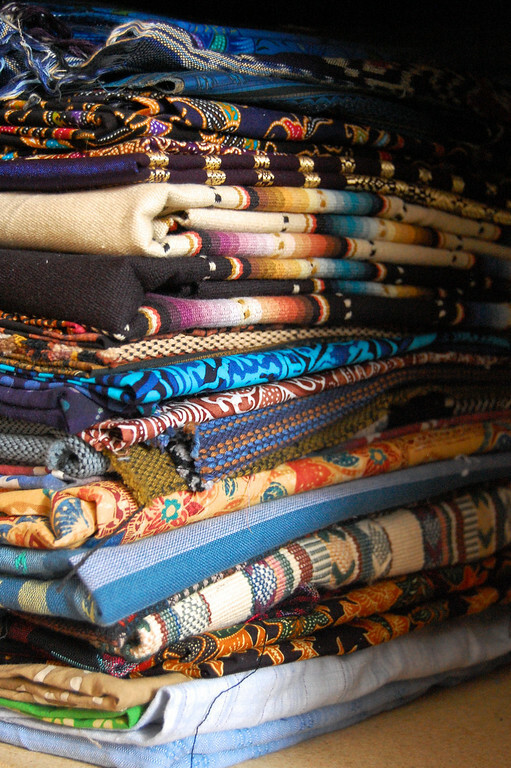 Of the fabric itself - the top two shelves are stuff that gets sewn into garments. The shelf below that is vanity fabric - printed stuff that I buy because it's pretty - it gets used mostly for craft-sewing or drapeless summery sundresses for the kids. The bottom shelf is what gets turned into bags and other receptacles. Orla lives on this shelf. 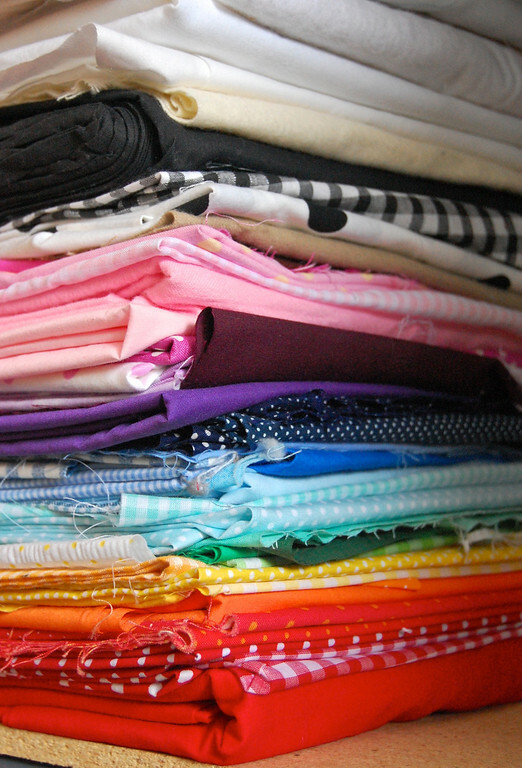 This stack is the only one I sorted by color - the very versatile cotton collection of solids, dots and ginghams. One of those tubs is Emily's - she wanted her own stash, so she filled a tub with plastic and metal needles, a measuring tape, a pincushion with pins, embroidery floss, hoops, some fabric, and her very own Unfinished Projects - one skirt and one bag. I actually think this is very silly, but I made labels for the tubs to force myself to get excited about putting stuff away when I'm done using them. 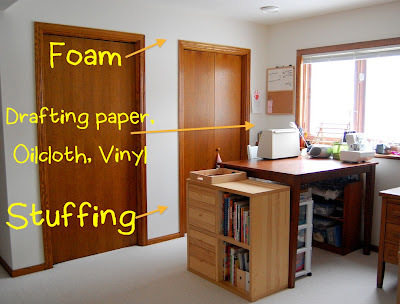 There are empty spaces on either side of the shelves in the closet, so I put stuff in there that doesn't need to be visible to be used: the high-density foam, bags of stuffing, and stuff that has to be stored in rolls - oilcloth, packcloth, vinyl and my rolls of drafting paper. 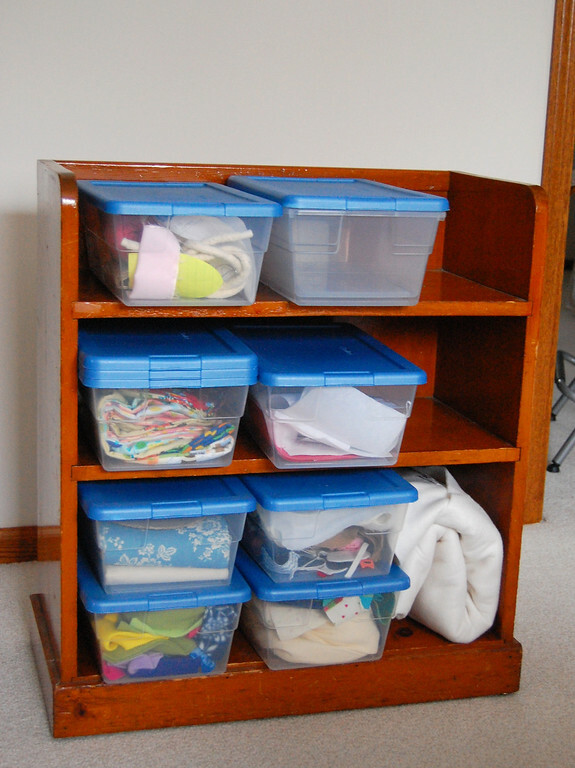 The little cubbyhole cabinet in front of the sewing table has an in-tray on top. In the four drawers are sewing thread, unfinished bibs (I am disgusted that they need an entire drawer so I will be trying to get rid of them soon), fat quarters and blog stuff - records and toy patterns and things like that. I discovered something interesting: fat quarters in the US and fat quarters in Singapore/Australia/possibly the UK too? are not the same size. They are bigger and squarer back home because we measure yardage in meters there. 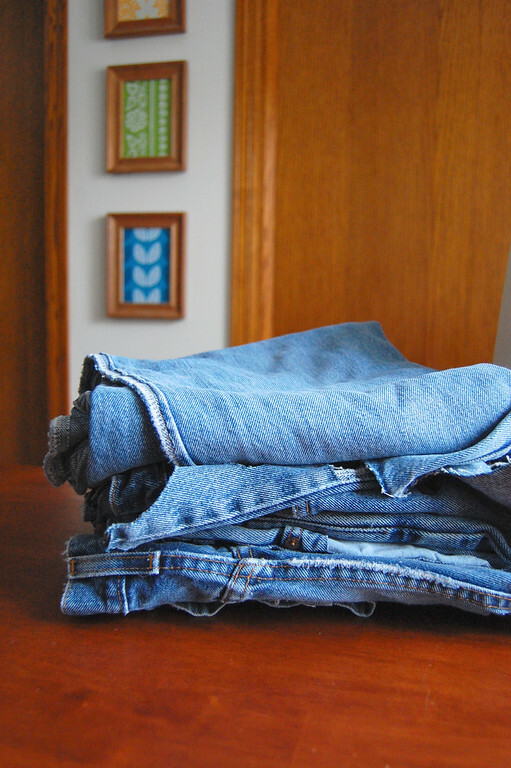 Makes completely sense now that I think about it, but it threw me off a bit when I was trying to fold them and they were different. The cubby holes hold sewing books and craft books, as well as clothes catalogs and the notebooks in which I sketch stuff I want to make. 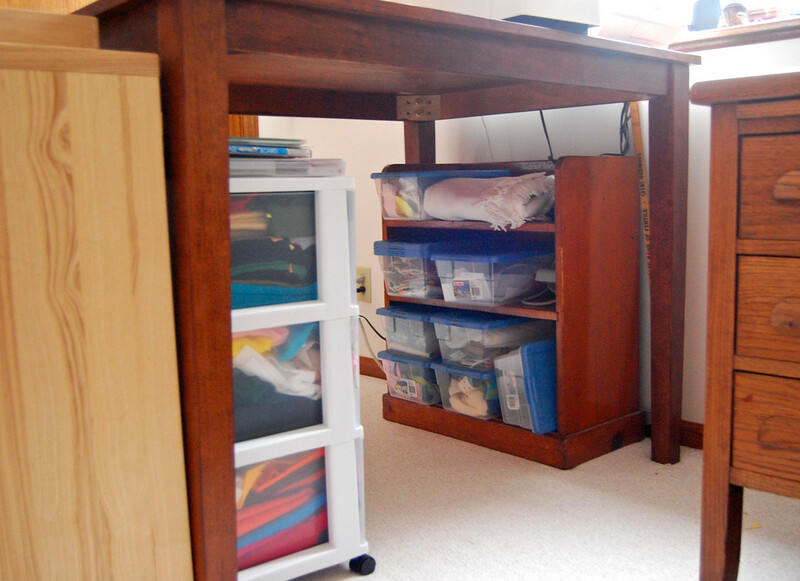 Under the sewing table are two more storage areas. 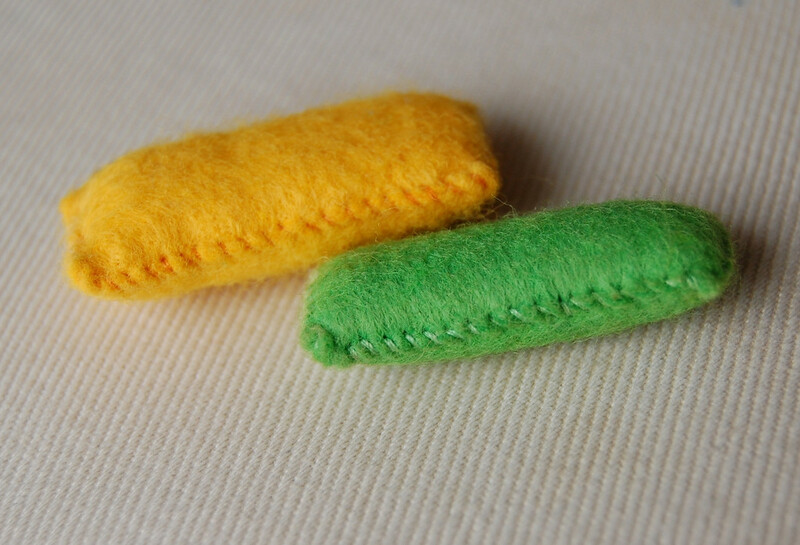 One is a rolling organizer for felt - wool felt vs acrylic. The other contains WIPs - one project per tub. Look - on the second shelf - bibs. Again. Grrrr. They're like an infestation. The rolled-up white thing is a white fleece blanket (from Ikea) that I use as my photography backdrop. The sewing table is counter-height so I can stand at it and sew or cut fabric without getting a backache. I often sew standing up because it prevents children climbing up on my chair to poke their fingers where it is sharp and dangerous. I also get to sit under the table to dig around in my felt stash, or meditate on my WIP tubs. It is more exciting if it feels like I am in a cave or a tent. I have to say, though, that I do most of my cutting on the floor. I've always been a floor person. I'm still not sure if I want to keep it there all year, or not. 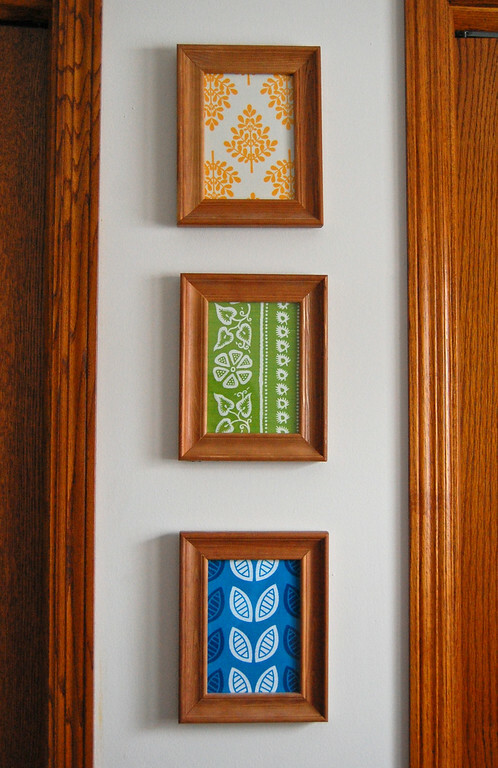 I found these wooden frames lying around in some other part of the house so I put fabric in them, and stuck them up with masking tape to see if I liked it. I wish they were a little smaller, but they'll do. So Sewing Room Organization - check. Phew. Exhuming the ghosts of fabrics past also turned up some interesting relics from my childhood. Emily was extremely excited to discover my ancient Dymo labelers, and happily printed out her name with one of them. She also found my pompom makers and wanted to make a pompom, so I had to deorganize my thread-and-yarn tub temporarily to get her some wool. Kate found my collection of Giant Marbles and hijacked it for the rest of the day. Jenna, bless her, left me alone. Here's a collection of circular things I experimented with in my teens. I suspect there might be a name for them - anyone know? They're thread wound around plastic washers - as I said earlier, I clearly had a lot of time on my hands then. 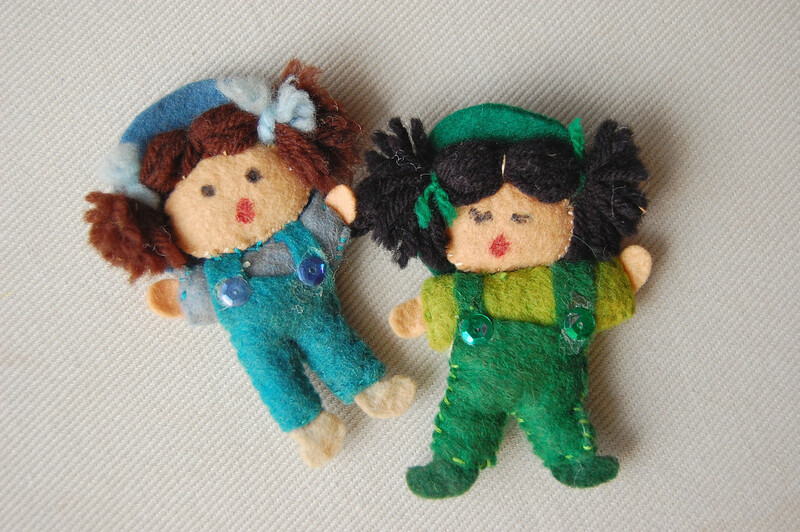 Here's felt food circa 1970/80's. 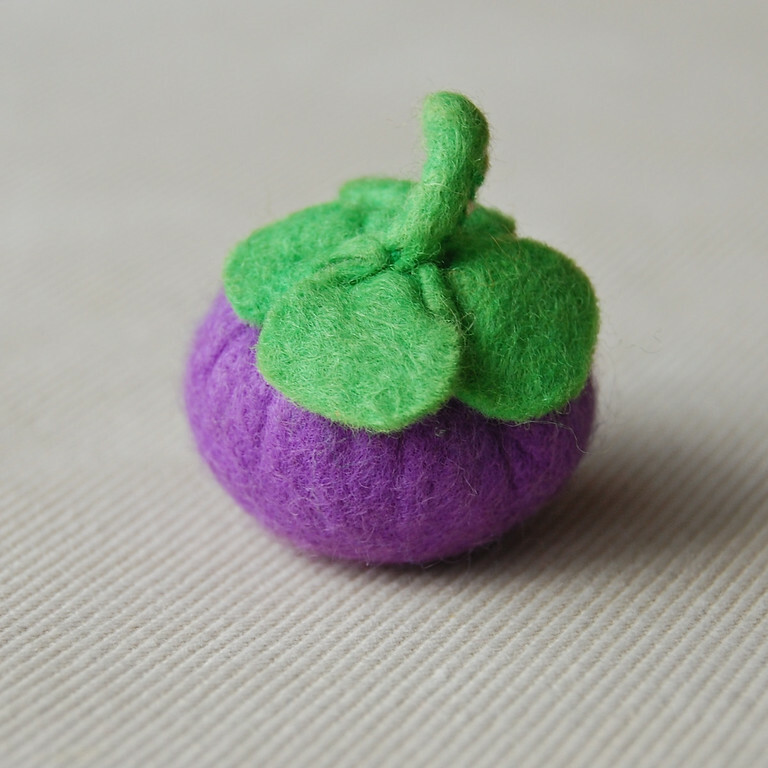 This is a mangosteen I made as a child. This next one is possibly the first stuffed animal I made. He is about 1.5" long, has a gaping head wound (repaired with glue where the sutures failed), detached retinas and atrophied neck muscles. I must have been 7 or 8 at the time because I made him to look like my then favorite softie, Terry the Turtle. Terry is gone now, so I'm glad I kept this little guy. Two of my first dolls. These are almost 3" high. I think I was about 9, maybe 10 when I made them. A later version had removable clothes. I'm almost sure I stitched some of them in class under my desk during the especially boring lessons. Doll pillows. 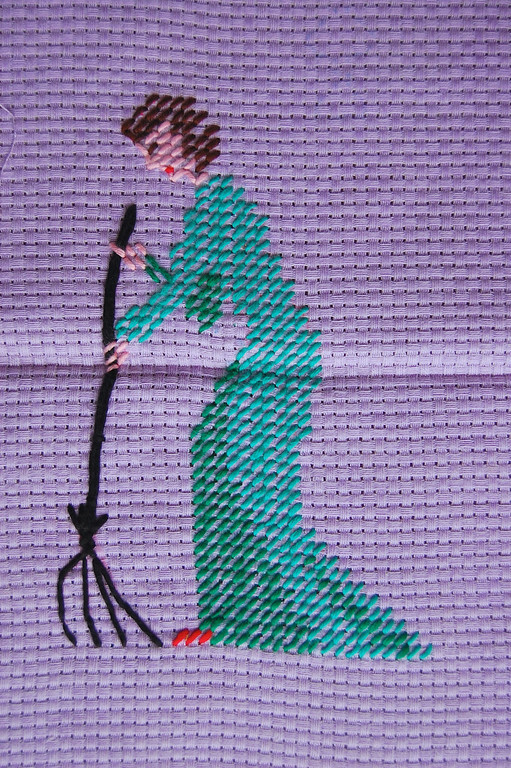 Check out the whip-stitching! Why can't I sew this neatly now? 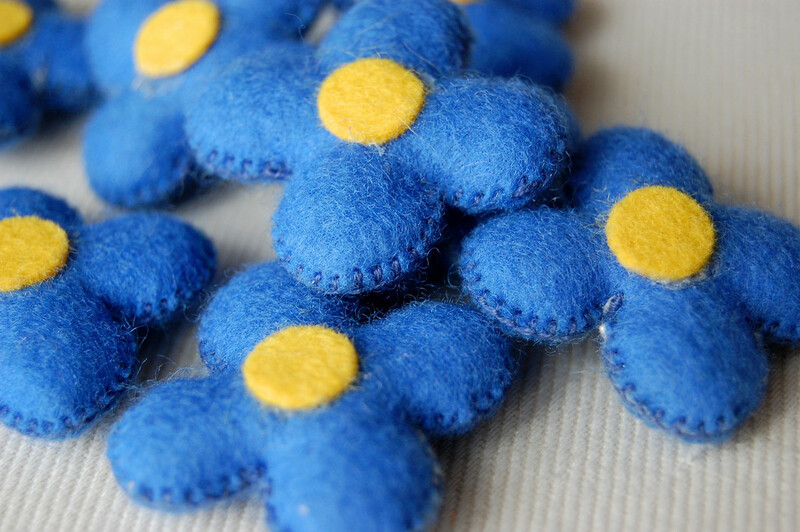 And speaking of deteriorating workmanship, here are some random felt flowers. 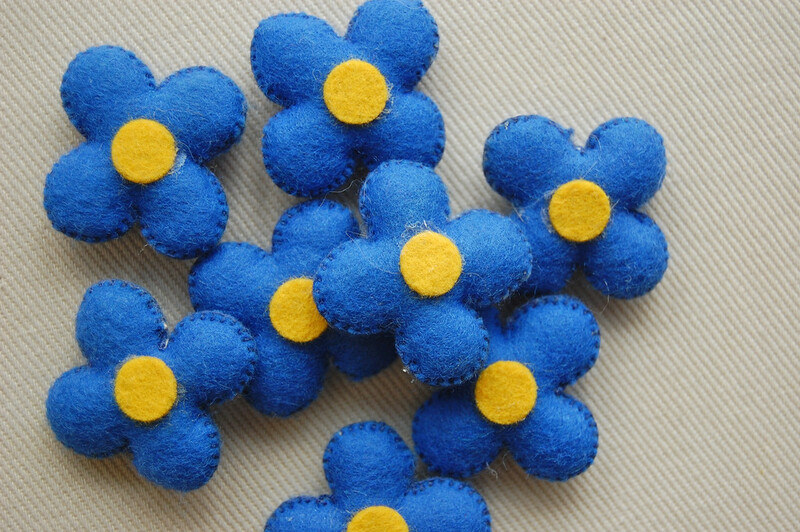 They were from a kit for making a felt dog - these flowers were to embellish his ears (why?). After I'd stitched them up, I decided to keep them as is, because they were so fat and cute. Looking at them this week when I dug them out, I was amazed at the stitching - I was a much, much, much better hand-seamstress at 9 than I am as an adult. 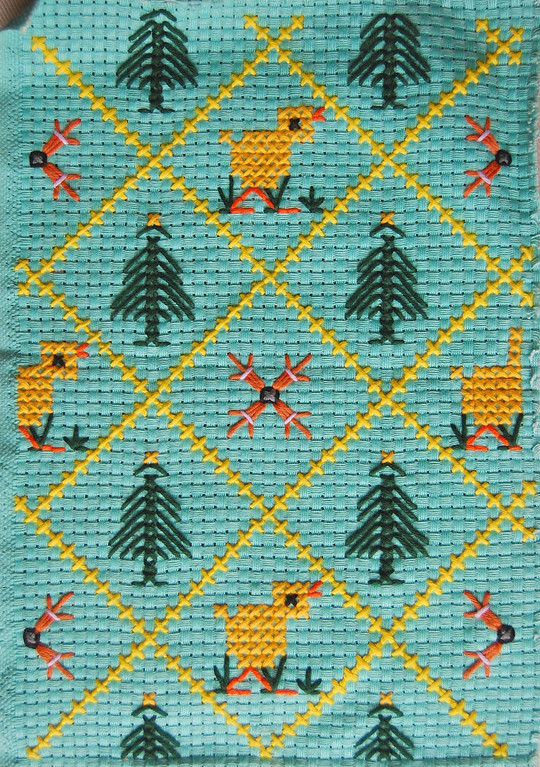 Dang, I wish I could still do a blanket stitch like that. 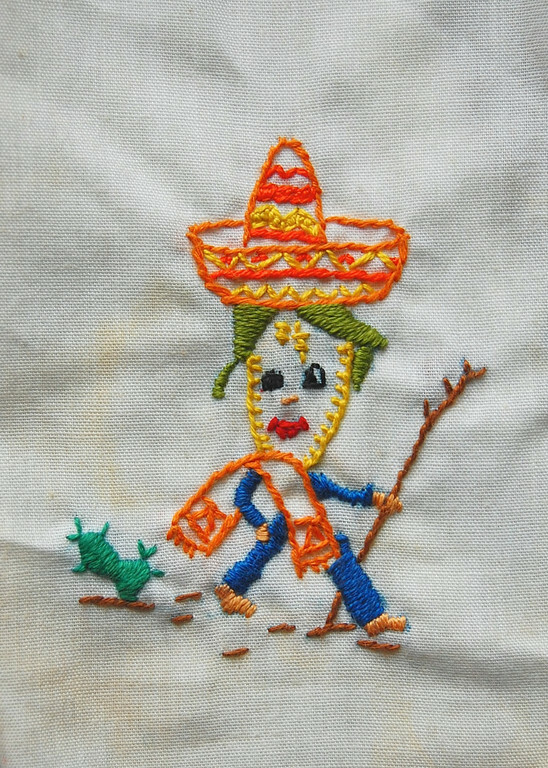 One of my first bits of practice embroidery - I must have been 11? 12? at the time. I remember being obsessed with produce with nationalities and clothes. There were the Spanish Onion, the Irish Potato, the American Pumpkin and a whole host of others, but this Mexican Corn was my favorite. Again, I don't think I can embroider this neatly now. 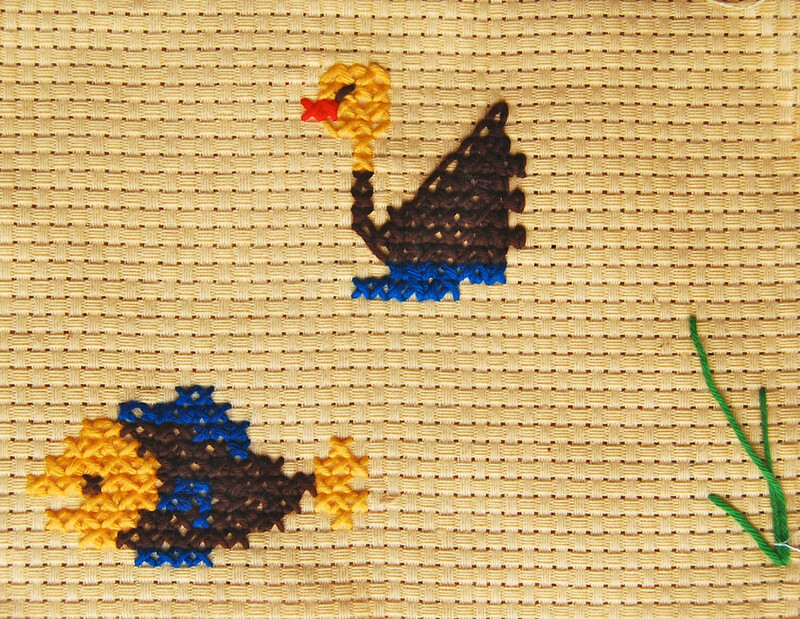 Just as I was beginning to feel intimidated by my overachieving preadolescent self, I found some cross-stitch! Snicker. Emily said, "worm trying to eat an acorn". Not really - it was my freehand rendition of Snake Slithering To Pond With Large Rock. 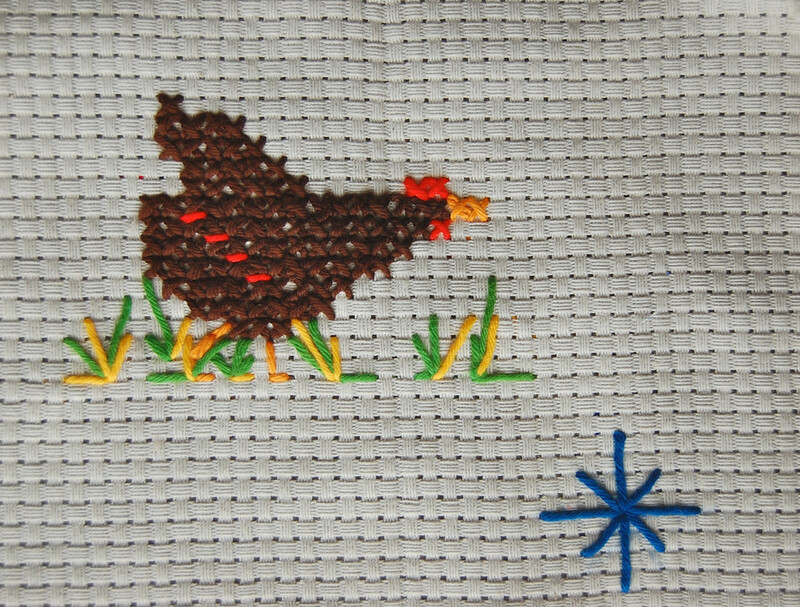 Chicken....... hm........... Years later, haunted by this one thought, I would (hurrah) abandon my career in cross-stitch and experiment with other media. I thought I'd share some of the other cross-stitch samplers I found mysteriously hiding in my stash, for two reasons. One, they weren't sewn by me, thankfully. I'm not sure who did - possibly my aunt, who was a sewing teacher when I was little. 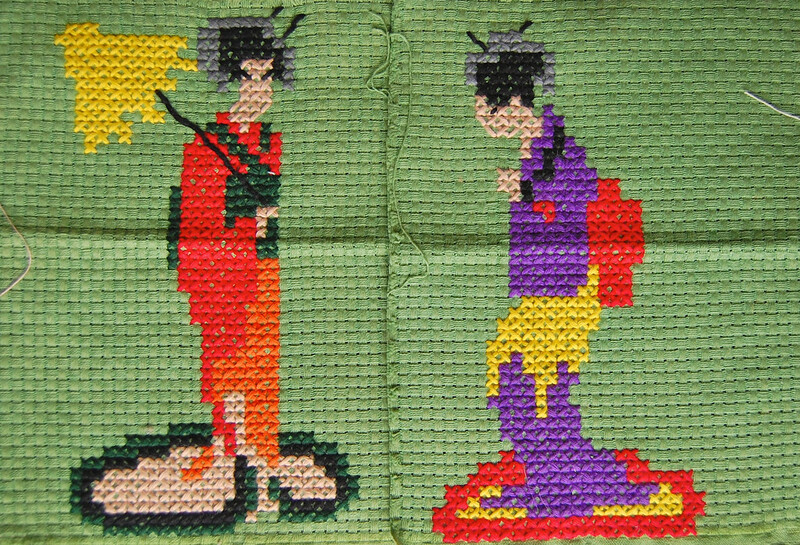 Two, they were samplers for a cross-stitch class for children, so they're quite different from the kind of elaborate cross-stitched nativity scenes that I see a lot of now. This was meant to be a bag, clearly - it was sewn into a tube before embellishing. I like how the top edge is folded down and frayed. I might sew it into a fabric bucket someday. And some Japanese figures. As a little girl, the left figure caused me great consternation because of her oversized bare feet. In spite of being explained to that it was her train, I was still very disturbed. And that brings us to the end of our tour. I haven't touched my sewing machine in three weeks, except to move it to dust under it. I feel very detoxed. 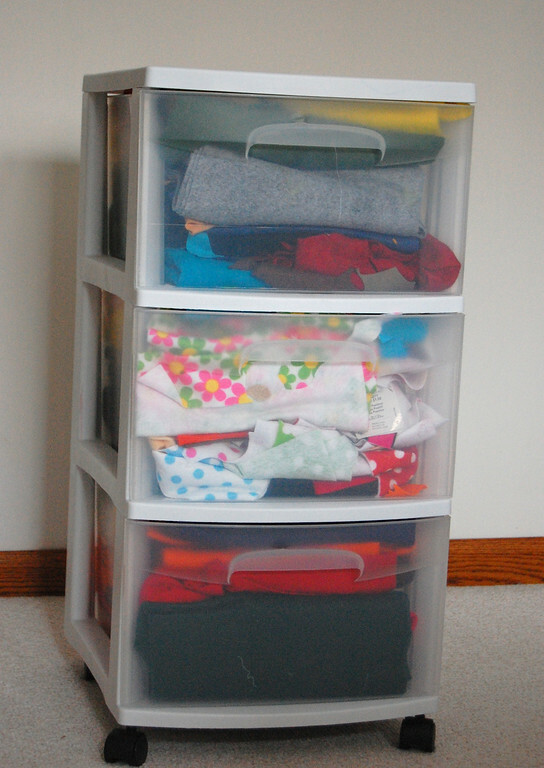 If not for Emily wanting to sew a small tote today with her new Stash Tub, I wouldn't have even taken its cover off. Have any of you taken a sewing sabbatical? I recommend it - it's lovely. and see if I can get them to look.... different. Wow, your closets look like a mini store! lol. Loved seeing your old projects! 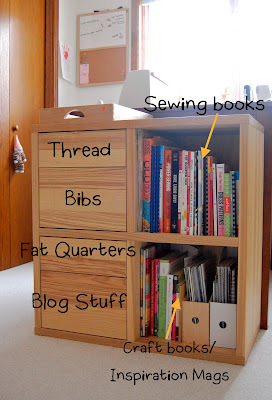 It was nice to read this post...so nice to see your organized sewing room...and lovely little pieces from the past. Hi! 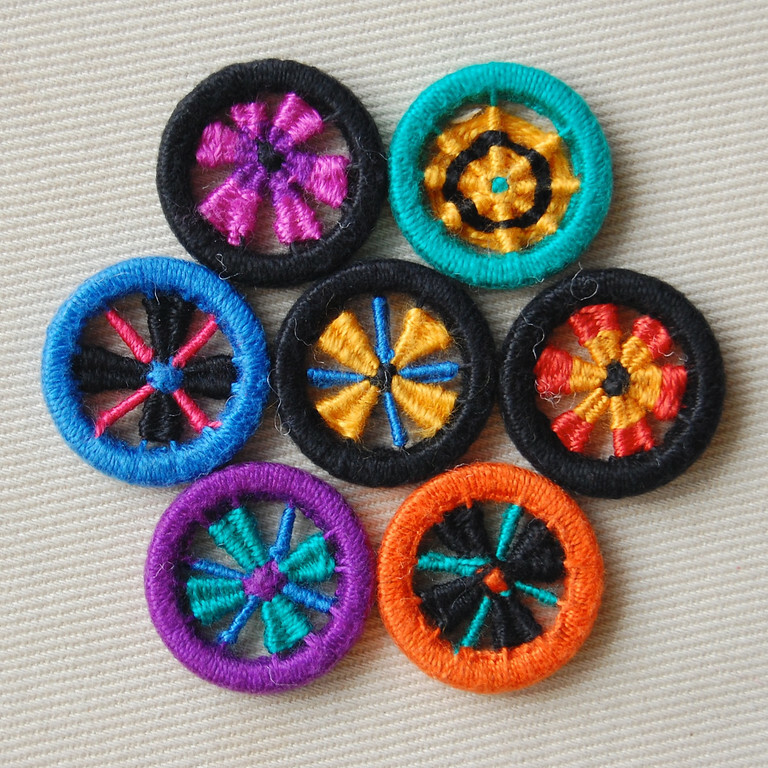 Those round things, with the plastic rings and yarn? They're called Dorset Buttons. I love making them but haven't in a while. There are too many things to make and never enough time! P.S. Love the heritage sewing item!! absolutely beautiful!I always feel great when i manage to get my little sewing room tidy again. can't wait to see what you create next! Bravo! Well done on getting so neat and organised. It's lovely to see all the pieces from your childhood - a stitched history to pass on to your girls. Those round objects are Dorset buttons. I love the bright colours you used. I label organized things around the house, not for myself, but because I hope that other people who live here will put things away too. Ha ha. I adore the framed fabric! Keep it. Good job, must be a relief. I'll get there one day. Of course, I'll need an actual sewing room first! I'm amazed and admire how long you've been sewing. Fascinating to me, wish I had that much experience. Thanks for sharing & inspiring! 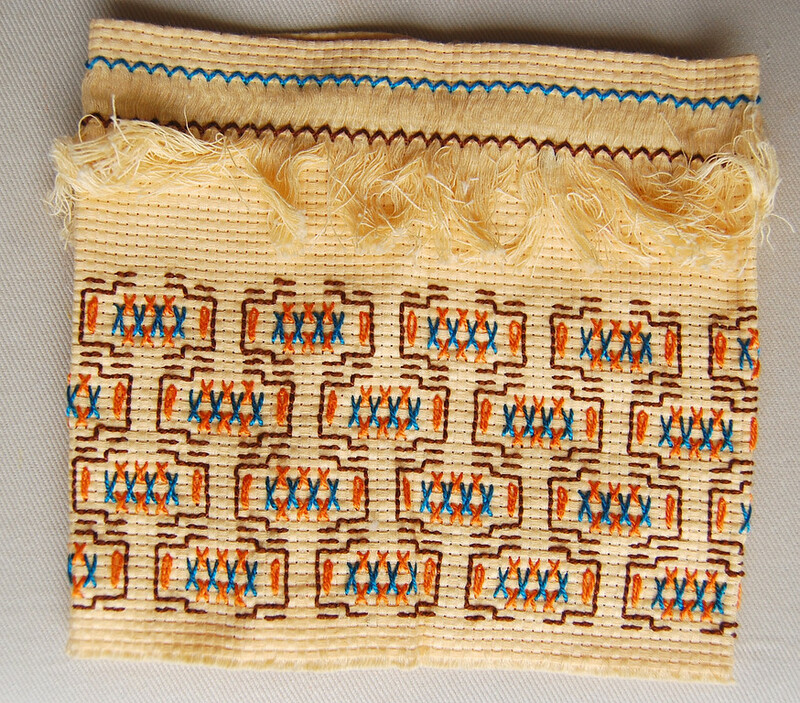 And that diagonal stitching looks really cool! Wow ! It looks so great now ! Good work, and happy sewing now. Oh what a fabulous post - I thoroughly enjoyed reading all through it and seeing what wonders you achieved. 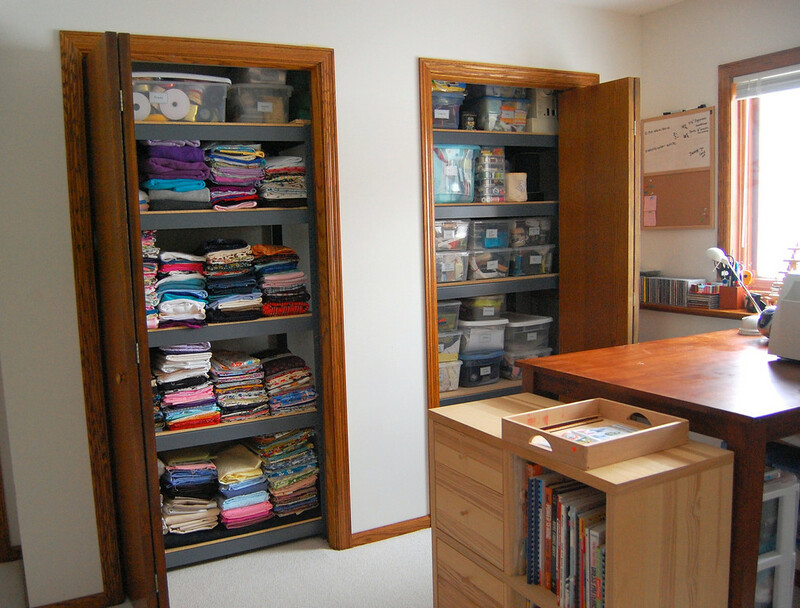 Your sewing room looks perfect and so organised. It was well worth the time and effort. 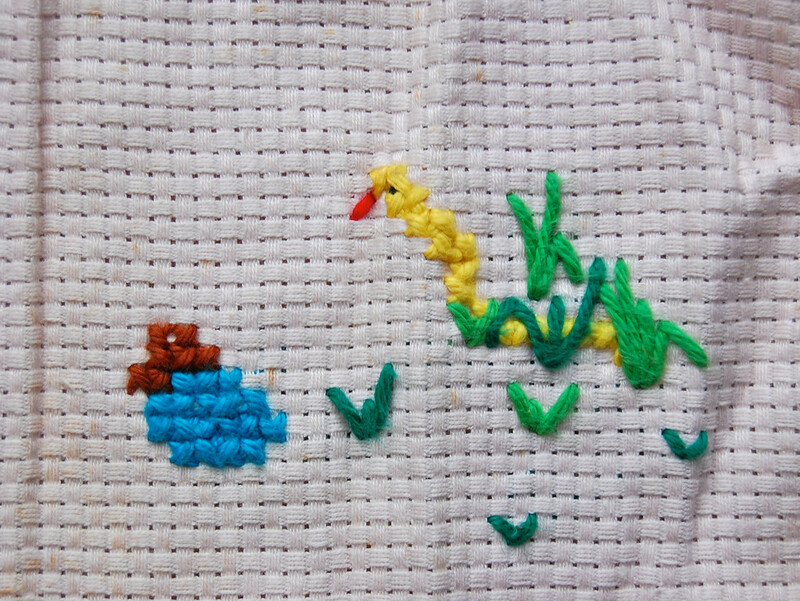 I loved seeing your early stitched work - must be lovely for your children seeing it too. Thanks for sharing and for the inspiration too! Congratulations! I enjoyed your childhood textile tour, too. What fun! Wow, definitely organzied AND nostalgic. 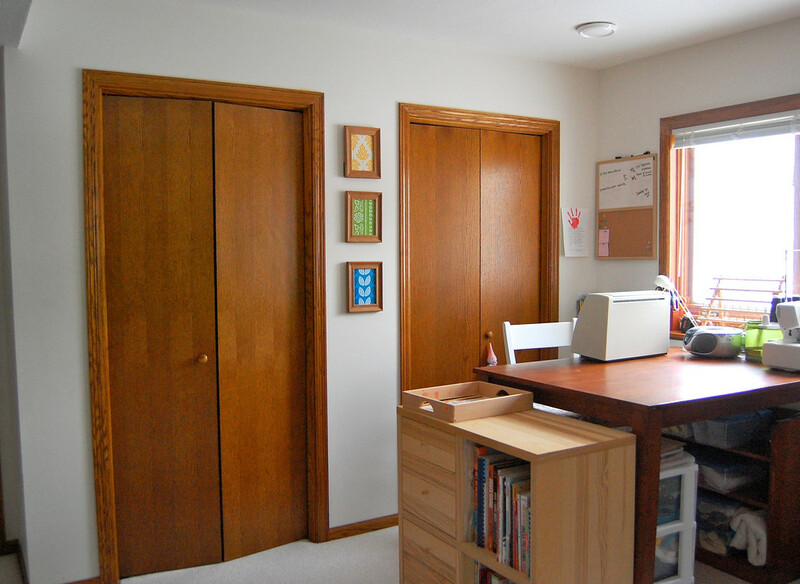 So fun to see your old old projects and the delightfully organized sewing room. Songbird and Kitty: thank you for the Dorset Buttons and the links! Those are some awesome photos. I didn't even consider them useful as buttons.... till now. Thank you, both! Mago: I've considered labeling my kitchen cupboards so visitors will feel more at home helping themselves to glasses, cutlery, cooking pots..... and hopefully they'll be comfortable enough to cook meals so I don't have to! 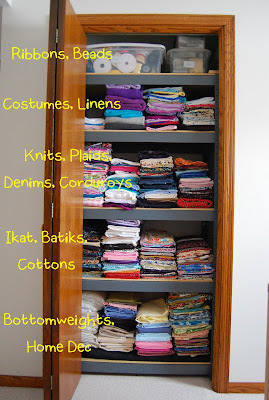 Katie: even without a sewing room, a person can do a lot! I hope someday you get a sewing room, with a door, even, so you can keep secrets within, and intruders without. Before I got a sewing room, I sewed in my bedroom for years, AND ran a business out of that same tiny room. Ridiculous to think about it now, but it worked then! I am SO impressed with your organization! You must feel great! There is something so intriguing about seeing how someone else organises their craft. 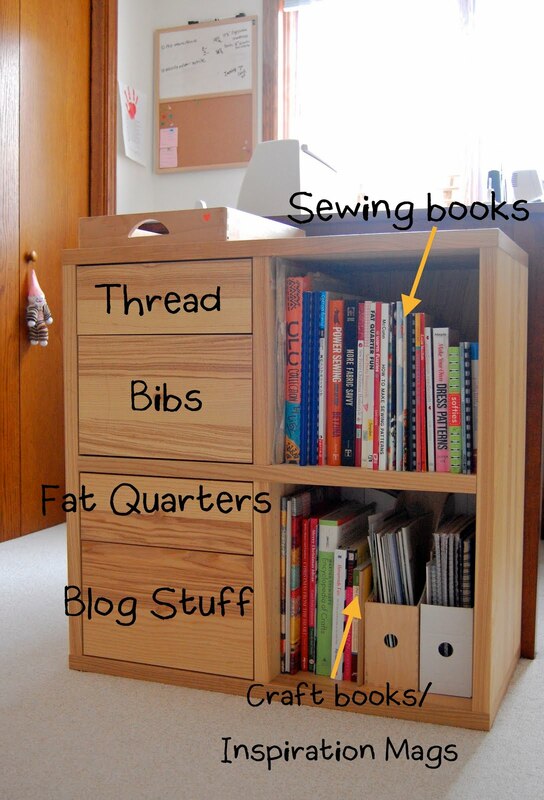 I'm getting ideas for when I have a room (or even a dedicated space) for sewing. You were talented even as a 7 year old, that is impressive! W.O.W.!! Beautiful job... pat yourself on the back and grab a jar of Nutella for your reward! Surely you must give yourself SOME kind of a reward for all that work. Congratulations on getting the craft room in order. And thanks for listing your childhood projects, your daughters will love looking through it seeing what their mom did when she was their age. I wish I had saved the crafty stuff I had done as a child. 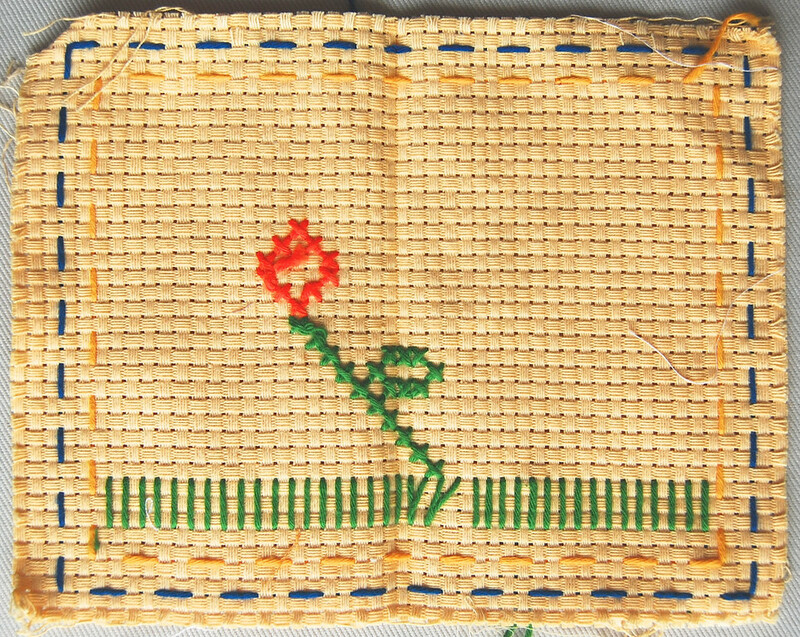 The hand stitching in your childhood projects is indeed very good. I think that my favorite findings are the mangosteen and the turtle. Those are really cute. Loverly. But do someday tell us what in the world you do with the cardboard. I've caught the bug and can't deal with the pile, either in the basement or up here in the "dining" (sit on the floor and play with the toddler / cut fabric at the table / drop the mail for ten days until the bills are due and missing) room. I'm not throwing all this good stuff away, but seriously, how do you keep it?! Very inspiring, L! I MUST do something in my craft corner too, but not today. 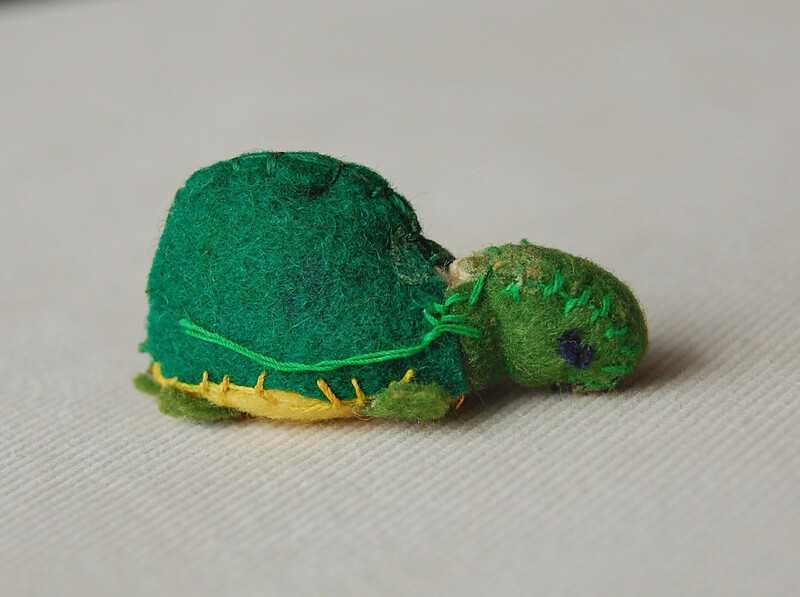 LOVED the turtle and other small things from your childhood. So cute! And the cross-stitch -- hilarious! It's nice to know where all the fantastic pieces come from! That's amazing, I hope I'll have a working room like that some day. You've always been so talented. I am SO SO SO jealous! How did you get all this done in just 5 days! AMAZING!!! !